This op-ed presents only the opinion of the author and is not an endorsement from the McGill Journal of Political Studies nor the McGill Political Science Students’ Association. Last Friday, after a grueling midterm on the history of American foreign relations, I sat in bed waiting for Susan Collins’ Senate speech. Earlier in the day, she had announced that she would vote “yes” on cloture regarding Brett Kavanaugh’s nomination, but that she would wait until 3pm that day to announce her final decision. At the time, only Senator Collins and Senator Joe Manchin (D-WV) had not made public statements on their decision regarding Kavanaugh, and it was pretty clear they would vote together, since neither wanted to be the deciding vote. At this point, both sides had 49 votes. Lisa Murkowski (R-AK) was the only one who had crossed party lines, and had committed to vote against Kavanaugh’s nomination. Murkowski, Collins, and the late John McCain were the three GOP senators who had voted with the Democrats to save the Affordable Care Act in 2017. I had high hopes Collins would follow Murkowski and oppose Kavanaugh. After all, Collins had a lot to lose no matter how she voted , even if she is only up for reelection in two years. If she voted against confirming Kavanaugh, she risked facing a pro-Trump primary opponent in 2020, and being shut-out of her party for crossing party lines for some of the most important votes. If she voted for Kavanaugh, she risked losing her status as a swing vote and moderate, which has allowed her to receive a lot of press coverage. Furthermore, an online campaign had raised millions of dollars to be donated to Collins’ 2020 Democratic opponent if she was to vote to confirm Kavanaugh. If Heitkamp, who could very well lose her seat in November due to this vote, could put principles above politics, surely Collins would do the same. As the title of this op-ed suggests, Collins did not follow in Heitkamp and Murkowski’s footsteps. Instead, she delivered a 40-minute speech in which she explained in detail why she would vote to confirm Kavanaugh. Her speech was not only deeply disappointing, but also quite shocking. She told one half-truth after another, and omitted multiple facts. It was as if she was trying to convince herself that the decision she had made was the right one. She complained about the “special-interest groups” who “whip their followers into a frenzy by spreading misrepresentations and outright falsehoods about Judge Kavanaugh’s judicial record,” without mentioning that Kavanaugh was selected from a list of 25 judges put together by the Federalist Society, a group of conservative lawyers (thus a special interest group). She praised Kavanaugh’s legal decisions and said she believed that he wouldn’t overturn Roe v. Wade, even if Kavanaugh, during his hearing, refused to say whether or not this was the case. The Supreme Court is meant to be impartial, but Kavanaugh clearly showed his partisan colors with this comment. Furthermore, during the hearing, Kavanaugh asked Amy Klobuchar (D-MN) about her drinking habits during a tense exchange with the senator. While he later apologized, his reaction to Klobuchar’s questioning casts a doubt on his ability to remain calm and level-headed on the bench. What was the most shocking part of Collins’ speech was her attempt at discrediting Christine Blasey Ford, immediately followed by her voicing support for the MeToo movement. Collins seems to have bought into the GOP-favourite doppelgänger theory, which argues that both Blasey Ford and Kavanaugh are telling the truth: Blasey Ford was assaulted when she was 15, but Kavanaugh was not her aggressor. 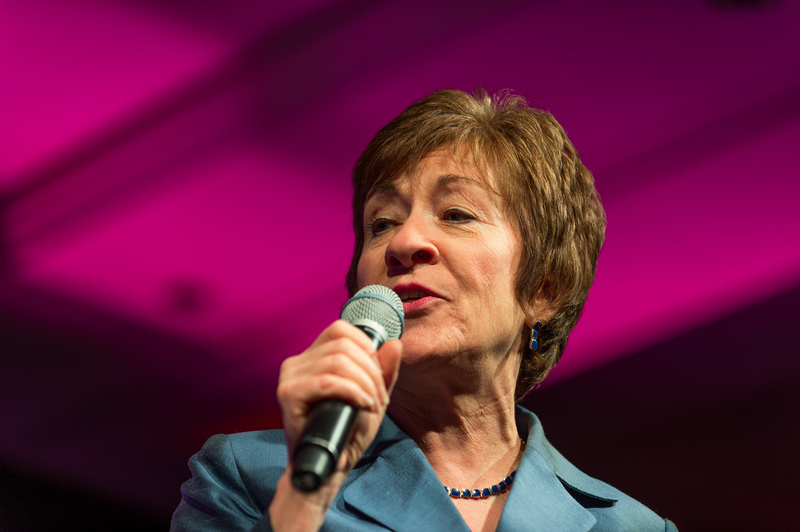 Collins then doubled down – on Saturday and Sunday, she appeared on various political shows to reaffirm her belief in this theory. To position herself as both a champion of Kavanaugh and the MeToo movement, Collins decided to state her belief in Blasey Ford’s trauma, while refusing to acknowledge she was telling the truth regarding her aggressor. Saturday Night Live’s latest cold open puts it best. Cecily Strong, as Susan Collins, declares: “Listen, I think it’s important to believe women — until it’s time to stop”. Collins also took a dig at Blasey Ford while on Face The Nation on Sunday. When asked about the tense Kavanaugh hearings, she saw some positive: “The one silver lining that I hope will come from this is that more women will press charges now, when they are assaulted.” She implied that if Blasey Ford had come forward when the assault occurred, her testimony would have been more credible. For someone who used her Senate speech to position herself as a champion of the MeToo movement, Collins does not seem to know that the vast majority of sexual assaults are never reported. By giving a lifetime appointment on the highest court of the land to someone accused of sexual assault and blaming the victim, Collins delegitimizes herself as an ally of the movement. Susan Collins was never going to save the U.S Senate and the confirmation process, which has been tainted with partisanship since Mitch McConnell refused to hold a hearing for Merrick Garland back in 2016. But maybe, in this time of deep political crisis and hyper partisanship, I had hoped that some Republicans could put country over party. Murkowski did, but I was hoping more would follow suit. What is particularly disappointing about Collins’ decision is that she seems to either be blindy ignoring the truth to further the Republican agenda, or has fully embraced the alternate reality the GOP created about this assault. And while this might be selfish, I was hoping that Collins, as a woman, would decide to support other women. While Susan Collins is not herself a victim of sexual assault, she knows (as she said in her speech Friday) many women who have been. Blasey Ford, who has no incentive to lie about this incident, spent hours detailing one of the worst moments of her life. Collins responded by pretending to understand, and then assuming that Blasey Ford is “confused” when it is convenient for her to do so. Susan Collins is obviously not the only one to blame here. Kavanaugh was confirmed because 49 other senators voted for him too. Jeff Flake, who loves making grand speeches on the Senate floor, fell in line. So did Ben Sasse (R-NE), who says that he “regularly thinks” about leaving the GOP. So did three other female senators, who never even expressed doubts about Kavanaugh: Shelley Moore Capito (R-WV), Joni Ernst (R-IA), and Cindy Hyde-Smith (R-MS). And so did Joe Manchin, the lone Democrat to vote for Kavanaugh, and who announced his decision via press release right after Collins’ speech. At least Collins had the decency to face the nation to announce her vote. In the end, Kavanaugh was confirmed 50-48, which is the closest vote for a Supreme Court nominee in more than a century. While the battle for his confirmation may be over, the divide it has created within the United States will take long to heal. Here’s to Heidi Heitkamp, Claire McCaskill, and Lisa Murkowski, and the other red-state Democrats who chose decency over politics. And here’s to Christine Blasey Ford, and the estimated 321,500 people who get sexually assaulted each year in the United States. Feature image by Stuart Isett for Fortune Live Media, via Flickr Creative Commons.